So, a little birdie tells me I should be posting my card of the day HERE and not just on this blog’s Facebook page, so I’m going to try to do that whenever I have the time or am not on the road when I post. Today, here’s another card from the Earth Warriors deck I picked up this weekend at the lovely shop, Renaissance Books & Gifts, in Springfield, MO. Hope you all enjoy it. No matter how compelling an experience of challenge, darkness, or defeat may seem, you have divine protection and the promise of safe passage through to the dawn. You will see and hear truth of the light. You shall not be alone on this journey. Soul guides now help you find your true north. If you have been proceeding along a dangerous path, even unknowingly, Pueo will navigate you safely away from evil and ill-wishing, guiding you back to your higher purpose and scared path. Meaning: Information that may have been hidden for a time will come to light. There is a guiding intelligence assisting you safely through a situation in our life that is otherwise confusing or dangerous for you. There are divine powers helping you in all situations to do with battles, unfairness, or injustice, whether you are consciously aware of those things or not. Trust in the signs that you see and especially in the truth that you hear – sometimes beneath what is actually being said. The accuracy of your insights and perceptions are heightened at this time. Aumakua, in Hawaiian, refers to venerable ancestors. This oracle also indicates that loved ones on the other side are sending you love and assistance and are receiving your prayers and intentions for the own healing. Spiritual Guidance: Through the form of Pueo, the guardian owl of Hawaii, invisible help from the spiritual worlds is with you, guiding and protecting you from spiritual warfare, seen and unsee. The concept of being in battle may seem far removed from what is, for many modern people, a fairly comfortable daily existence. Yet when we feel blocked from fulfilling our life purpose – whether due to a busy schedule, inner doubts, external obstacles of some other unknown reason – spiritual warfare is exactly what is taking place. 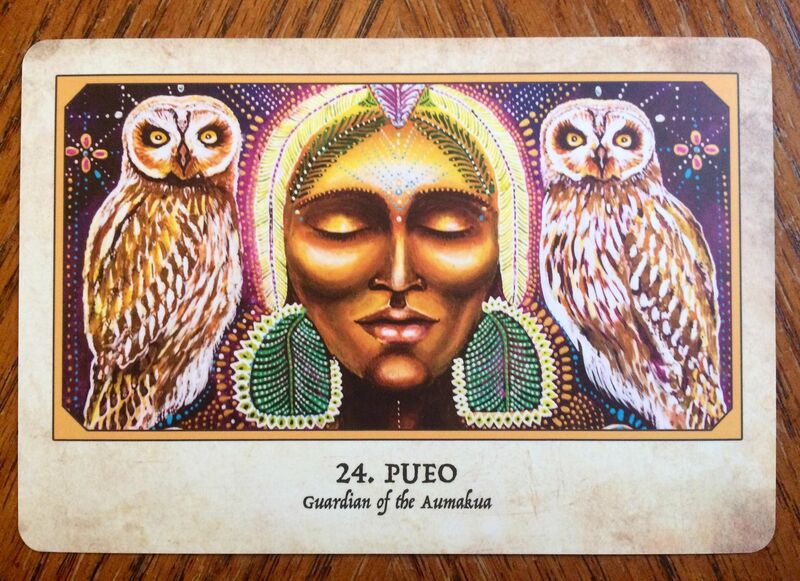 Pueo comes to you with powerful protection for your soul during a spiritual battle. Even when you cannot sense the spiritual light, it is with you, taking the form of allies in the realm of nature, soul, and spirit to secure your safe passage through challenge and into fulfillment.